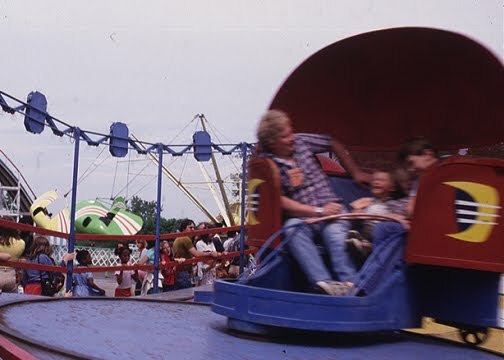 Do you ever feel like you just got off an amusement park ride that was spinning too fast? That's kinda how I'm feeling, a little wobbly, as I try to regain my balance this week. As many of you know, my mom ended up in the hospital for multiple blood clots in both of her lungs the day I last posted. We're so thankful for the gift of more life together. A friend, who is also a nurse, told me yesterday that 80% of people with pulmonary embolisms don't make it to the hospital. Mom was admitted on Wednesday morning, November 18th and stayed until Wednesday night, November 25th. We were told she'd be there two nights but each day a new door opened to the unexpected and her release date was extended. The doctors told us she had a blood clot, most likely in her leg, that dislodged and went through her heart before it shattered into several smaller clots into both lungs. They immediately put her on Coumadin, a blood thinner, to prevent more clotting. She was supposed to go home that Friday evening, but she developed severe lower left back pain and a fever. They put her on morphine to ease her pain and by the time the Dr came to see her Sat morning, she was feeling a bit better. She self-diagnosed that she'd pulled a muscle doing her breathing exercises and her Dr. believed her. Unfortunately, I was not at the hospital when all this happened. By the time I got there she was "morphed" out of pain and in a deep sleep most of Saturday. Eventually the morphine wore off and I was able to see the excruciating pain she had. It was classic kidney stone symptoms so we ordered another CT scan and they found a 5mm stone in her left kidney. On Monday they decided to do surgery to remove it since it was too large to pass. But when they went in to start the surgery they discovered she had a severe kidney infection so they had to stop the procedure. Her fever continued to increase and some concerns also developed about pneumonia so they decided to keep her until Wednesday. By that morning, my mom was planning our Thanksgiving day menu and her escape! Fortunately, they determined she was well enough to go home and we all got to be together for Thanksgiving day and weekend. She's moved in with us for at least this week and we'll see each day how she is doing and what plans we need to make. She will also be having surgery this week to remove the kidney stone, we hope. This past week, I have felt like my life was tilting and whirling at high speed! Between dropping being at the hospital with my mom as much as possible since I am the only family in town, being her hospital care advocate, keeping other family members posted on her condition, finding someone to watch Aster every day, worrying about her being confused because her new mommy was gone, arranging carpool for the boys and trying to keep their schedules as normal as possible... I have felt totally out of sorts. 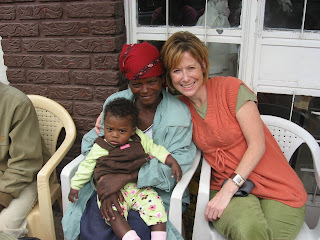 It's been so hard to see my mom who is so energetic and spunky become pale, weak and very uncomfortable. But oh how thankful I am that I know the One who holds my world and my days in His hands. I couldn't do it without Him. I'd be a basket case! I am so grateful I can look to Him to help me find balance today, and a new way of doing life each day as we move forward. Has your life felt a little too much tilt and whirl lately? Is some area spinning out of control? Do you feel off balance? I know where you are and I'd love to know how I can pray for you!! Our family has been so blessed by so many prayers and so much support. We'd love to give some back to you! My mom called this morning at 6:45am to tell us she was having a hard time breathing and needed to go to the Emergency Room. JJ, being the rescue hero that he is, jumped in his truck and went to get her. When they got to the ER the tests showed that her EKG was normal but her blood pressure was high. They've been doing more tests and they think she has a blood clot in her lung. They just did a CT scan and we're waiting for the results. She will be admitted soon. I was so looking forward to today! On Wednesdays my mom has started coming over to watch Aster so I can work on my book. It's been wonderful to watch the two of them giggle and snuggle and bond. And I've gotten to spend extra time with my mom talking over lunch and enjoying Aster together during my breaks. We have enjoyed some really sweet times these past few weeks - it's amazing what Aster has brought to our lives to tie our heart strings together even tighter than they were before. 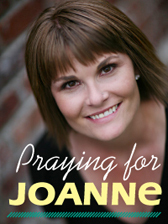 Will you please pray for my mom? Her name is Sylvia. I'll post updates on Twitter since they both feed to my blog and facebook. Thanks friends! I wanted to share with you a link to my friend Melissa's devotion she wrote today at P31. It is powerful and raw, beautiful and transparent. Melissa shares her story of feeling stained and ruined by sexual abuse as a child but finding redemption and worth in Christ. She is also giving away a copy of Wendy Blight's book, "Hidden Joy in a Dark Corner, on her blog. If you leave your email you will be entered to win and she'll send you a list of 10 ways you can know you are worthy of God's love. I got back from Reno late Sunday night, and it was wonderful!! I absolutely loved the many women I met there. Kelli and Heidi, I am so proud of you for saying yes to God and stepping out in faith to do this conference! And I'm so honored God invited me to be part of what He is doing in and through you!! Jesus' presence filled that room and each of us in such a beautiful way this weekend, revealing His heart and His plans to each in powerful and personal ways. I loved hearing the women share with me how God spoke to them individually through some part of the message, and what they were going to do to apply it in their lives. My heart was also so full of joy for two new sisters in Christ who invited Him to be their Savior Friday night. I came home tired but energized, drained but filled, knowing He is worthy of all that I have and my life is worthy of all the He has for me. It made me want to go into this week laying it down before Him again, and asking Him to live His life through mine. Well, I am going to go spend some time with my princess! Be sure to read Melissa's devotion here and her blog post here. No matter what happened in your past, God has hope, redemption and purpose for your future! I know because I am living proof of that promise. Hi friends! I've been traveling today and just got to Reno with Leah! I'm speaking at a Holiday event tonight (Friday) and it starts at 7pm which is 10pm my time. Will you say a little prayer for me that my words are anointed, my thoughts are clear and that my mind and spirit are fully awake even if my body wishes it was asleep? Oh, and that I don's slur any words. That would be so good. I also have the blessing of speaking at mom's morning of encouragement tomorrow! I am so excited to be here. I just love these women we've been praying for and planning with for months!!! It was rainy and cold here Tuesday. Aster discovered the raindrops and knelt beside our back door to watch them trickle down the window and puddle on our porch. It was so, so sweet to watch her as she watched them for the first time. There was a chill in the air, so I turned on the heat. And for some reason that created a trickle of thoughts in my mind. Thoughts about Aster's birth mom. Thoughts about how cold she must get and how she has no heat to turn on. 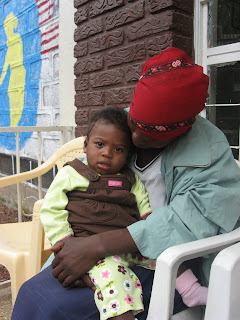 Thoughts about how damp the one room adobe home where she lives must feel when it rains. I felt sad and wished she was here with me in my warm house watching our beautiful little girl discover rain drops. I thought about the day we met Hagere. 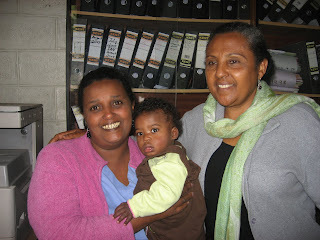 I couldn't believe it had been a month that we returned from Ethiopia with Aster, and just two days before that we drove down the dusty, bumpy roads of Addis to meet her birth mom. It was a day I had prayed for and yet a day I was very nervous about. I wondered what I should say or ask her. What would Aster want to know? I couldn't sleep much the night before so I prayed through the early morning hours about our meeting and my concerns. 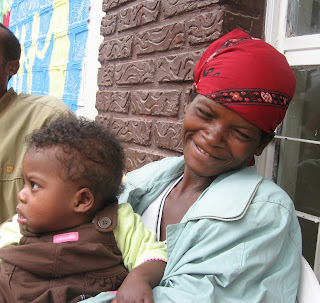 Aster's paperwork said her father had abandoned them when she was 8mos pregnant, and that she could not take care of her baby, her firstborn, her only child. 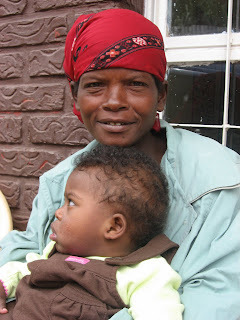 But I'd struggled with how Aster would feel that her birth mom put her up for adoption although she was still alive. God reminded me how He'd provided answers to those questions earlier that week. 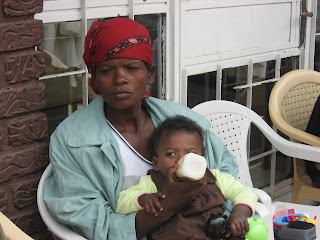 I'd met the doctor who cared for Aster when she was hospitalized for severe malnutrition. 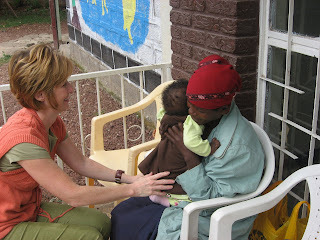 He was amazed by her current weight and told me Aster's skin had been hanging off her bones when she was first admitted. Aster would not have survived had she not been placed for adoption. 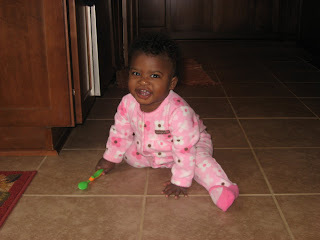 Here's a photo of what she looked like then at 6 months, weighing only 8 lbs. 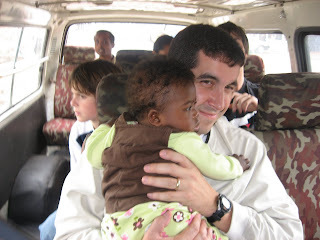 Remembering how God provided answers to those troubling questions, I tucked His assurance in my heart that He would provide again as we pulled up to the orphanage where we were meeting Hagere. As we got out of the van, we were greeted by two beautiful women who took Aster and started singing and kissing her and shouting, "Aster?? This is Aster? Look, this is Aster!" And then I saw her. Sitting quietly on the porch. Waiting. I immediately walked up to her and said hello and asked if she wanted to hold Aster. She smiled and said yes with her eyes. Hagere, being only 28 years old, looked worn and frail. So timid. Yet peaceful. I'm not sure what made Hagere laugh, but I loved seeing her beautiful smile. Oh the difference a hug can make. If you click on this photo you can really see how Hagere's smile changed when I put my arm around her. Hagere spoke very little. They explained to us that women are very subdued in the region she is from and that she is very shy. 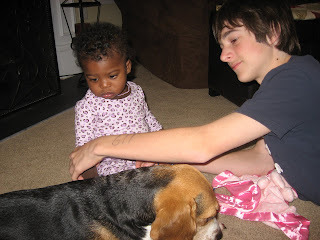 She only said she wanted to thank us and tell us that she wants Aster to be with our family. I sensed that she wanted to give us her blessing. 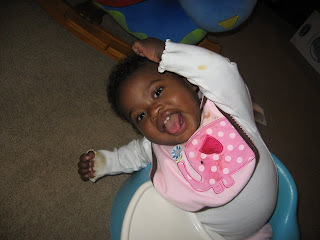 I told her we knew Aster was a gift from God and that we had been praying He would bring us a little girl for years. She cried. Then she told the interpreters that she wanted us to know that she is a Christian, too. We were shocked. We had not mentioned we were Christians because we knew it's a very Muslim influenced area and it could hinder our conversation. The fact that she would use those words to describe her faith was the biggest gift Jesus could give to us in that moment. God had answered another one of my deepest prayers! 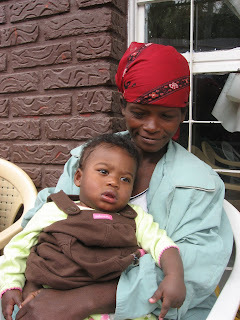 I started bawling and told her about all of you who were praying for Aster and that I knew God had a plan for her life. She had decided to give Aster back to me at one point in our conversation. I wanted her to see Aster smile so I started playing patty cake. 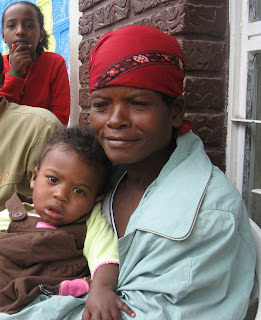 We talked some more, asking questions about her family and living conditions. Her cousin had brought her and he explained that Hagere's mother is still alive and Hagere lives with her along with 4 cousins and brothers in a one room mud hut. He told us that they are very, very poor and can barely feed themselves. That is why she could not take care of Aster. He looked very sad but also very thankful to see her doing so well. I thought she might want to see Aster's cute little toes so I took off one of her socks. Then I gave her back to Hagere and offered her a bottle to feed her. She seemed so pensive. 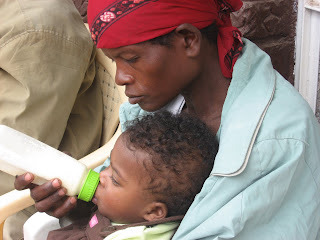 It seemed so unfair to me that I could provide formula when I know with all my heart this young mother would do anything to provide her baby her mother's milk. It was bittersweet to share this moment together. And then our visit faded toward the end of our time together. She leaned close to hug her good-bye. We gave Hagere a hug and then took her and her cousin to the city to catch a bus. JJ and I were so thankful for how our time together had gone. It could not have been any better. God's so good!!! There is so much more I want to share, but this post is already so long. If you'd like to follow Aster's story and our family's journey be sure to come back, or sign up for email updates in the top right sidebar under the P31 logo where there is a place to put your email. In the meantime, I'll be here with my beautiful girl watching raindrops and praying that Hagere knows I'm thinking about her and praying for her every time I see the rain. A special "welcome" to those of you who found your way here through my Encouragement for Today devotion. I hope Steven's story touched your heart. I know if it weren't for the power of encouragement from God's Words to me and His love expressed through people, I wouldn't be who I am today. I also know how hard it is when you don't have the gift of someone encouraging you not to give up. I have been in that longing and lonely place, too. But one day God challenged me to become for someone else what I wish I had for myself, and it changed me forever. I pray that my blog will be a source of encouragement for you today! First, I'd like to share with you the story of sacrificial love expressed by a mother named Hagere who chose life for her baby girl. 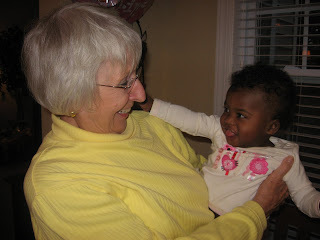 A baby she named Aster who God called our family to adopt a month ago from Ethiopia. 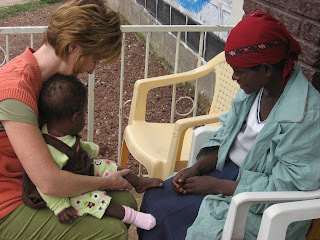 Hagere's story is reshaping me as a woman, wife and mom as I have seen the sacrificial love of my Savior through her. I posted the story here. I'm praying that each of you who stops by my little corner of the world will read it and hear words of encouragement spoken from your Father's heart bringing hope and courage to yours. I also wanted to share how our family has seen the power of encouragement through our sponsorship of another Ethiopian girl named Meseret with Compassion International. She is 17 now, and was only 4 when we started sponsoring her. 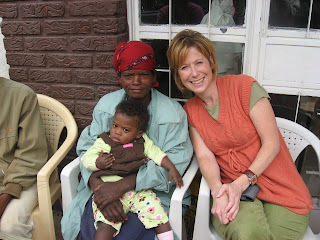 I'll be posting more soon about meeting her while we were in Ethiopia and seeing firsthand the amazing impact Compassion has made in her life along with our family's love, support and letters to her for 13 years. Maybe today you might consider how you could bring encouragement to a child's life through Compassion International. 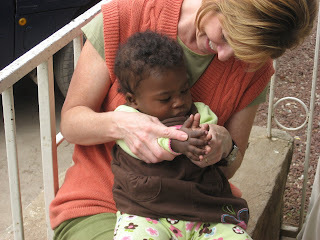 Click on in the blue box that says "Sponsor a Child" in my sidebar to find out more. Blessings and prayers of encouragement for you today! 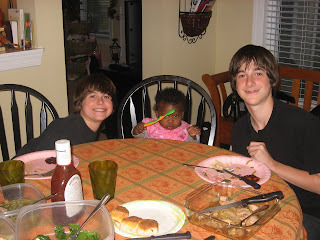 I am often asked how our boys are adjusting to us having Aster in our family. And I always say, "They are crazy about her! And she adores them, too." 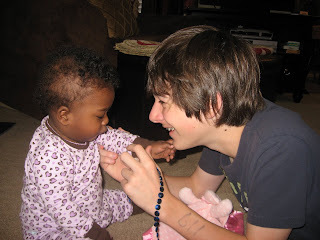 It is one of the sweetest blessings to see them enjoying her so much! Joshua and Andrew used to call shotgun in the morning and fight over who gets to sit in the front seat on the way to school. Now they "call" who gets to sit next to Aster. And at dinner they usually sit on each side. Unless she's spewing food; then no one sits next to the princess. They used to be distracted by snacks, phone calls and after school plans with friends. Now they are distracted by the coos and calls of their baby sister. 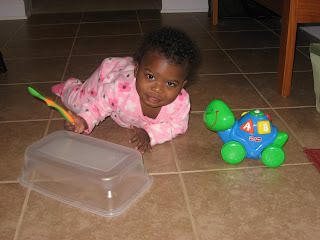 Sometimes I'll find them playing with her in the living room when they are supposed to be working on homework or housework. But I understand; I can't get enough of her either! They used to be all about themselves during our morning rush. Now they pitch in to help because we need them more than ever. Yesterday I asked and they kindly made my coffee, got Aster dressed and loaded the car so I could get myself and Aster fed and out the door on time. Sometimes I overhear them talking about her and I can tell they're surprised by how much fun she is. Like yesterday on the way home from school they went back and forth: "Aster is so happy and sweet." "Yea, just think of what she'd be doing if she were still in the orphanage." "She'd be crying." "I'm glad she's with us." Last night at dinner, they were reminding me of how sad I was when another adoption referral fell through last fall and how I cried because we didn't get to adopt two other little girls. And then Andrew pointed to Aster who was in my arms laughing and playing and said, "See mom, she was the one God had already picked out for our family." A blog and a baby - can I have both? 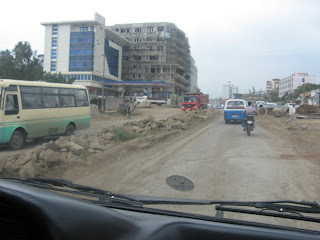 I've struggled almost daily with not being able to blog much since we got home from Ethiopia with Aster. Not because I don't love every minute with my new little girl. I'm seriously more crazy about her than I ever thought I could be this quickly! And not because I feel pressure to blog. It's because I don't want to give up this part of me. I miss it. I've tried again and again to write a post - in my head and on the page of my heart. But then that little bundle of sweetness decides to wake up or make a messy diaper or do something cute that totally distracts me. And I am starting to feel like maybe all my adult conversation words have been deleted from my brain. I still have the basics like" yes" and "I don't know" and "when will you be home?" 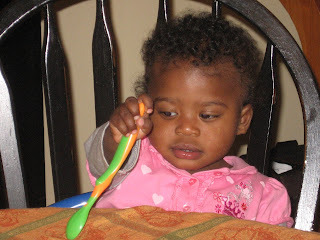 But the rest have been converted to cooing and sounding out "ma ma" and "da da" and "no - don't touch." Do you know if it's scientifically proven that sleep deprivation and an abundance of dirty diaper fumes affects the part of your brain that strings letters into words and words into sentences? My days are not full of words anymore but sweet snapshots of the moments we have with our sweet girl. I can't tell you how many times I pull her close, right up into my face, and take a picture with the click of my heart. 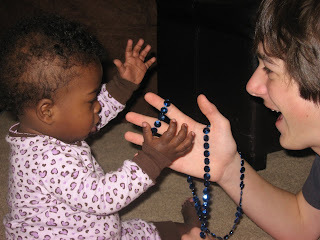 I am praying for a new way of journeying to the heart of God with you in this new season of life with a baby. I want to get creative and have a plan. Maybe have certain topics I write about like Monday's for moms and participate in things like "Tuesdays Unwrapped" and other ideas that could give my currently unstructured blog/brain/life a little form. In some ways, I feel like my blog is turning into a scrapbook and for some reason I am hesitant about that. Yet I want to capture the memories and stories of Aster and I don't have time to blog and scrapbook. Plus I just signed a book contract (yay!) and will need to reserve some creative thinking for this bigger-than-me assignment. I know God's got a plan so I'm just asking Him to show me what it is. I thought you might have suggestions? Any thoughts on what might work for me? Topics you like to talk about? Do you get tired of seeing all these photos of Aster? Is that the dumbest question a mom can ask? Since I'm challenged in the 'thinking' department these days I was thinking you could brainstorm with me.